In the game of Go, two players alternate placing black and white stones on lattice points of an n × n grid, each attempting to surround as much territory (i.e., regions of unfilled lattice points) as possible. At the end of the game, the score for each player is the total area of the territory surrounded by his or her stones. 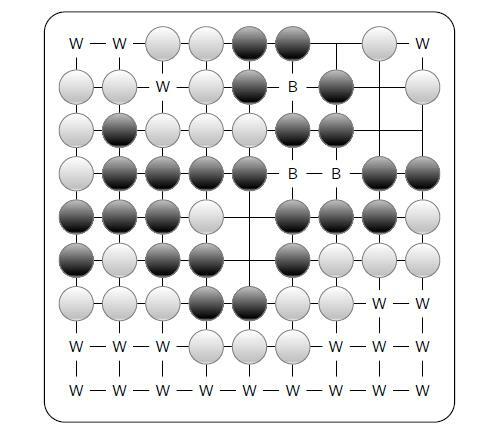 Given the locations of black and white stones on a Go board at the end of a match, your task is to compute the score of each player in order to determine the winner. located at the same lattice point. Input is terminated by a single line containing only the number 0; do not process this line. For each test case, print either “White wins by ”, “Black wins by ”, or “Draw”. Go는 일본말이라서 Baduk으로 바꿨습니다. 바둑이 사실 국제 표준어(? )가 없어요. 중국에선 Weiqi라고 하죠.